A hearty congratulations goes out to Redline Guide Jeffrey Shutak for earning his Wilderness First Responder (WFR) certification from the SOLO School of Wilderness Medicine. Affectionately referred to as a “Woofer,” not to be confused with the “Woofah” for those earning just the Wilderess First Aid (WFA) certification. It’s awesome that Jeffrey did this. Should any of our guests have a medical situation or injury while in his charge, they should now be in very capable hands. When Jeffrey joined us he had no medical certifications but quickly earned his WFA — also from SOLO — just to hold him over until his WFR class came up and so that he could get out and work. We admire that kind of dedication. Thank you, Jeffrey. And again, congratulations! Here are a few photos from the course followed by an outstanding essay by Jeffrey about taking the course. We love it! 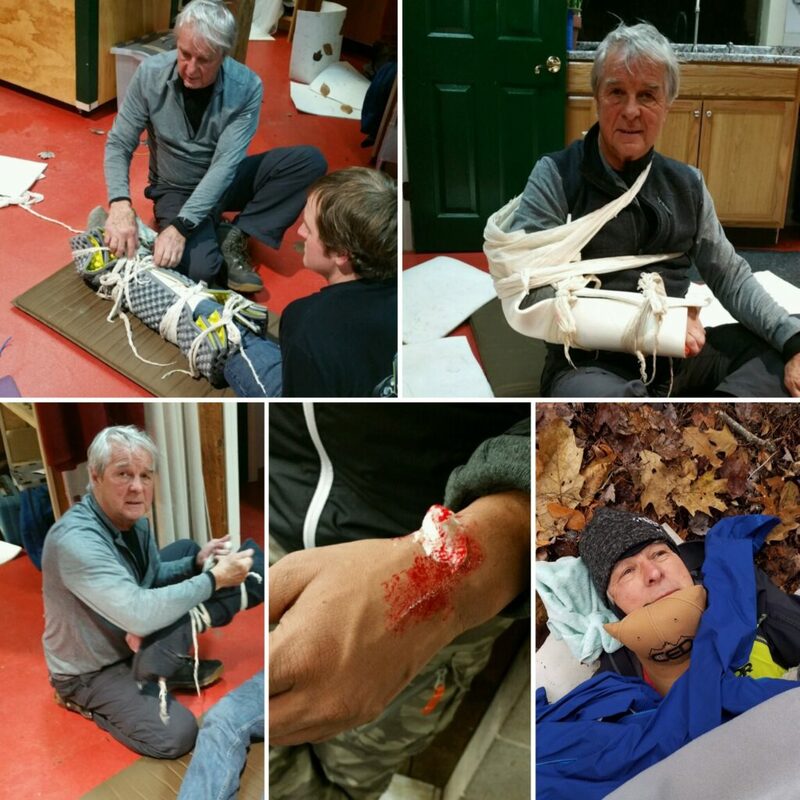 I subsequently enrolled in the two day, sixteen hour, SOLO Wilderness First Aid course. I discovered I really enjoyed it and felt more confident in leading my hiking guests on anywhere from a one to five days of hiking adventures. But I felt I needed more, so I enrolled in the eight day, eighty hour WFR. WFR is no simple weekend program. Given the commitment, it’s no surprise that most of the students in my course were there for their jobs, whether to certify in hopes of finding something in the outdoor space or adding to what they already had for their guiding, summer camp, even fire department gig. In fairness, WFR is a lot in time and cost; Beginning at seven am breakfast and ending at 5 pm When 5pm rolls around you’re worn out doing studying, practicing and practical sessions. Tuesdays and Thursdays were extended days, beginning at seven am breakfast and ending at eight pm that night. In addition, we were required in assisting with clean up in the kitchen and sweeping the main classrooms and bunk area. I hardy had time to return home, mentally exhausted to prepare for the next course day. When I went into WFR, I thought it would be long sessions practicing basic first aid and talking about a few other conditions but by the time I left, I realized I had gained a comprehensive skillset to approach a myriad of issues in the wilderness setting. Upon arrival, it was clear we had a pretty varied group of folks. There were people from New England, MA , ME, VT, Pennsylvania, New York, Alaska, California, Utah, even India to name a few. Most people had limited to no medical backgrounds, some were preparing to be EMTs, some were college students, some were unemployed, and some were professionals, working for hospitals, schools, and even park rangers. As SOLO really tries to foster a sense of community by interactive lessons and group contribution to facility upkeep, I knew this would be a great chance to meet some awesome new people. I wasn’t let down. Most of them lived in the Toad Hall (dormitory) together, and we ate the provided meals together. The best part about the SOLO WFR course was the instruction and course curriculum. Our instructors were Josh and Sue. Josh is a WEMT, local firefighter and ambulance EMT, and a member of the Conway Mountain Rescue Service. As soon as you meet them, you can tell they know their stuff. Despite their young ages of maybe 30 something, it is clear they have seen just about every medical emergency in the field. This intensive experience, coupled with Josh’s gregarious personality and clear lecturing style, makes him a phenomenal instructor. The course material includes everything from your basic ways to check vital signs, musculoskeletal injuries, chest and head trauma, environmental emergencies (i.e. 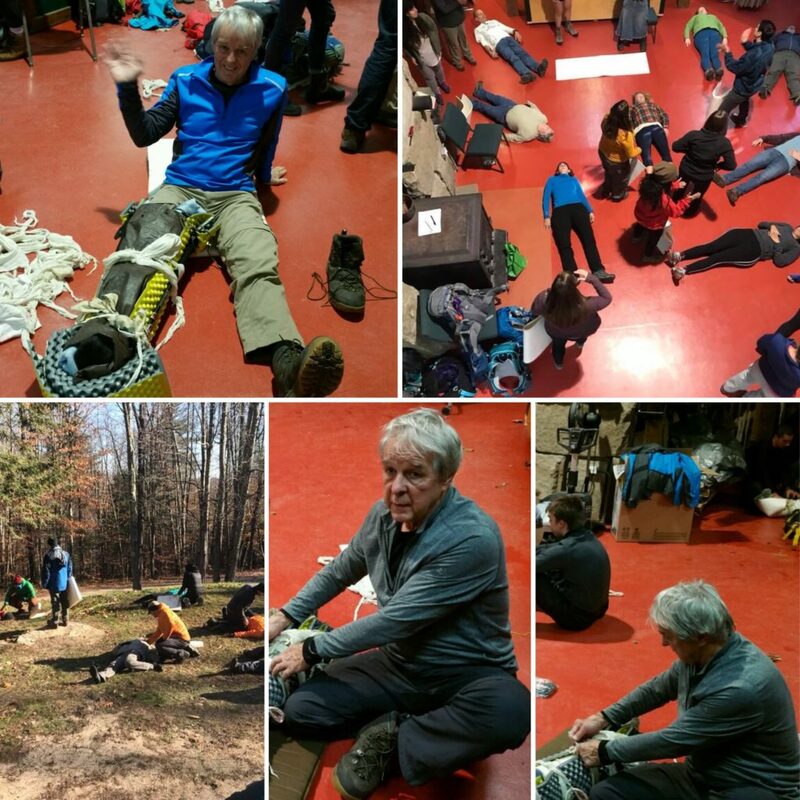 hypothermia), shelter building and improvised litter building, and more! 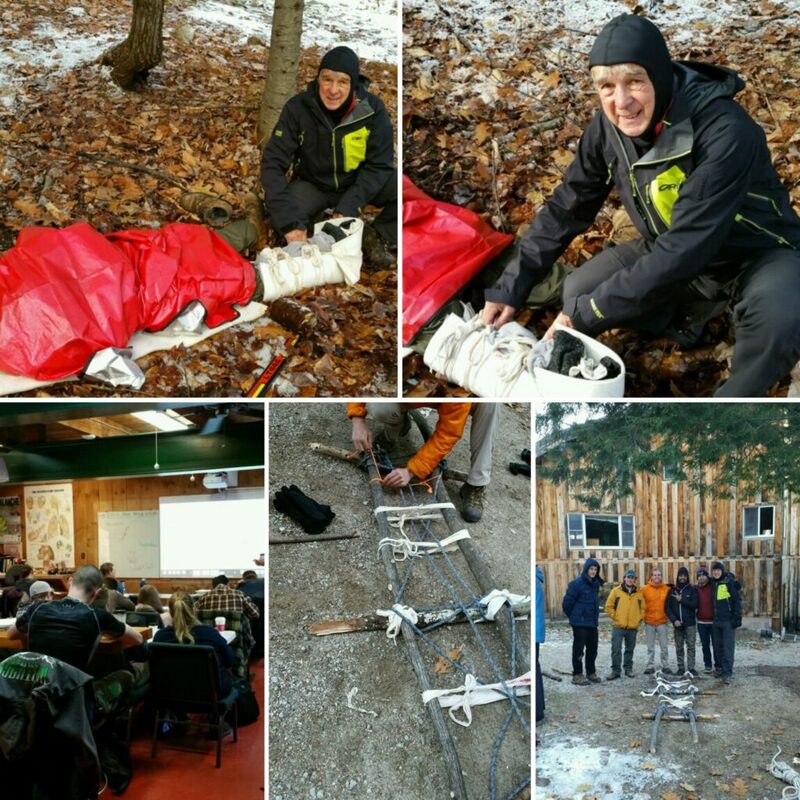 I felt the curriculum was very comprehensive, and provided me with a wealth of knowledge to deal with most of the common emergencies seen in the backcountry. As empowered as I feel right now, I certainly won’t pretend that eight days of training makes me a medical expert but the interesting thing about WFR is how it recognizes the unique situations the wild presents and trains its students to fully take them on. In the “front country,” we have 911, ambulances and most of us are usually just minutes away from specialists who are equipped, supported and backed by all sorts of tools and people. Out in the wilderness aka the “back country” it takes many hours, even days for help even on urgent issues. The back country lacks the gear and technology that your seasoned professional is often use to, that can put them at a complete standstill when something does go wrong, That’s where WFR kicks in by teaching enough skills to identify an issue, assess for bigger problems, treat with what resources you have and bring in the support needed to walk someone out or make the judgement to continue on. I call it the MacGyver of medicine. As a result of this course my backpack has gained an additional fifteen pounds in emergency equipment, but I don’t mind the extra weight, as I now feel confident that I can quickly access, treat, stabilize an emergency situation leading up to an evacuation or wait for a rescue team to arrive on the scene to further treat the injured person. What this translates to is not a scene from a Hollywood movie and I now have an idea how a tracheotomy works although I am not qualified to perform one, or how to do open heart surgery; but I can clean, splint and immobilize an open arm fracture in just a few minutes in the field when it’s needed using the everyday gear in my backpack. I can also construct a liter using materials in the outdoors coupled with what I have in my backpack. If there’s one thing you should understand about WFR it’s that the book is just the beginning. Anyone can open up pages and memorize the details but that’s a heck of a lot different than applying it to someone unresponsive or screaming in pain which is why so much of the course is about field practice. Each day we would head outside in the snow and rain time after time to drill on assessing patents, handling the critical spine/breathing/circulation concerns and then applying the basics in mock scenarios. On CPR day, it wasn’t theory, test, go home… but info, and practice in rotations for as much as four hours. The course material included everything from your basic ways to check vital signs to musculoskeletal injuries, chest and head trauma, environmental emergencies (i.e. 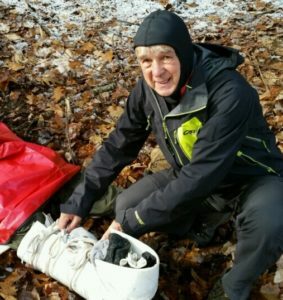 hypothermia), shelter building and improvised litter building, and more! I felt the curriculum was very comprehensive, and provided me with a wealth of knowledge to deal with most of the common emergencies seen in the backcountry. I feel 100% more confident in leading my outdoor guests on various outdoor adventures. I would HIGHLY recommend that anyone take this course, especially if your work involves being in the outdoors. And lastly I want to thank my “boss” (and friend) Mike Cherim for his help, guidance and patience in making me a better guide. Would you like to earn one of these certifications for yourself? We have 2018 classes scheduled. Check it out.